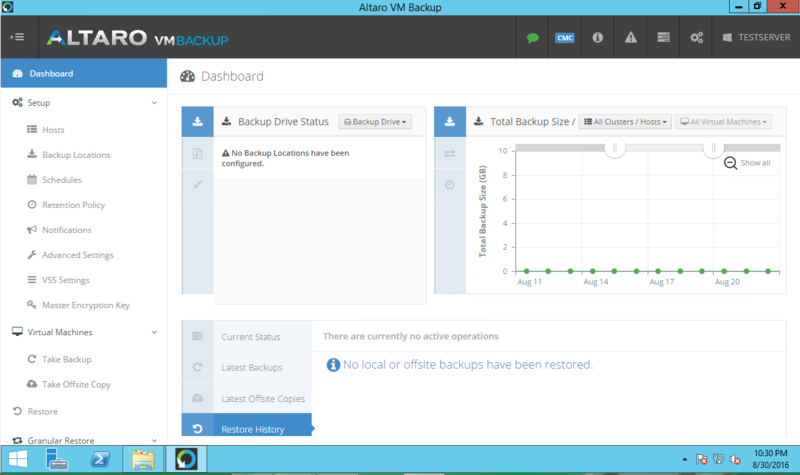 I’m using Altaro VM Backup for my Hyper-V whitebox environment for a couple of years now. Recently I tested the latest version. Hereby my experiences. Their latest version of VM Backup changed in comparison to previous versions. I noticed several new features/improvements and a slightly improved UI. Altaro can be installed on a physical host or in a virtual machine. There is no Linux version (or OVF) available. (It would be nice to have that option although!) Configuring the program is very easy. In just a few steps you’re ready to go! First configure the VMware or Hyper-V server (or vCenter), specify the IP settings and login creds and go to the following steps. Specify a back-up location, either a normal backup location (physical drive or network path) or a offsite location (either a physical drive, drive rotation or swap schema, network path of Altaro Offsite Server with WAN Acceleration). Configure the schedule, retention policy, the notifications and advanced settings (VSS, master encryption) You are all done configuring! Now we are ready to back-up your virtual machines! Just 2 options, choose to take a backup or take a offsite copy. Restoring the virtual machine is easy, you can use the default restore option or the granular option. 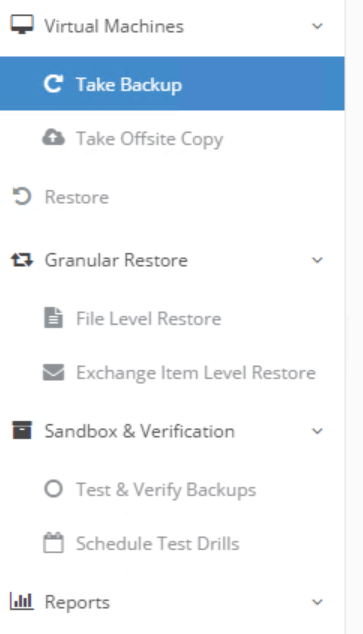 With the granular restore you can specify specific files or folders to restore. It’s even possible to open an exchange edb file to restore specific exchange items (mail, calender items etc). A nice option is, that it’s very easy to test your backups using the sandbox feature. Using this feature you can test your backup&restore in just a few steps. It does a complete restore in a virtual (sandbox) environment. So nothing happens with your running VMs. Using this method you can test the complete backup/restore procedure. 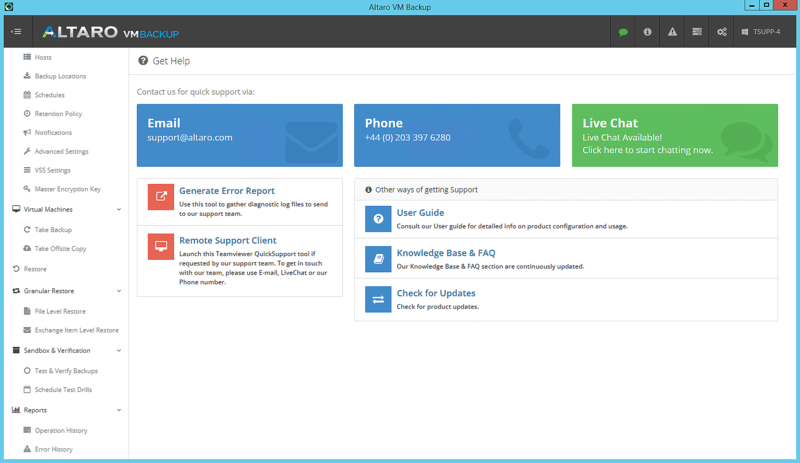 You can use email and phone support, but a nice feature is the Live Chat support option. All the necessary information can easily be given to Altaro support so that they can help you. A very nice and unique feature! If you are love security Altaro VM Backup give you the option to use an encryption key in your backups. So in case of stolen your backups or any other scenario nobody can restore it if doesn’t has the encryption key. Altaro built in al the reporting tools you need. In one overview you see your backup and restore results and actions.